Remember 01382552755 for club Newsline. Rangers (Kilwinning, Kilsyth and Cambuslang) are now 15/8 to win the Junor Cup. The Glens (Glenafton, Glenrothes and Glencairn) are 11/4 to win the Junior Cup. manager Dave Baikie cover for league fixtures. After training this week Port have a couple of players who will have late fitness tests before Saturdays match, both are hopeful they will make selection. confident that he should fit for Saturday! MOST people dream of one day having their pick of some of the biggest clubs in Britain Click here for more. for the NCR (North / Tayside) Cup 3rd round we're away to Parkvale in Aberdeen. That tie is on 7th February at 1.45pm kick-off. John Ward is available this weekend (Oakley away)after his one game suspension. Bonnyrigg Rose v Maryhill; Hill of Beath v Culter; Royal Albert or Kelty Hearts v Musselburgh Ath; Renfrew v Linlithgow Rose; Shettleston v Kilwinning Rangers; Vale of Leven v Cambuslang Rangers; Blantyre Vics v Neilston; Tayport v Arniston Rangers; Glenrothes v Lochgelly Albert; Glencairn v Beith; Newtongrange Star v Bathgate Th or Hurlford Utd; Bo'ness Utd v Glenafton Ath; Sauchie v Largs Thistle; Darvel v Kilbirnie Ladeside; Dunipace v Forth Wanderers. a SPECIAL MALT WHISKY blended to celebrate the clubs successes. Montrose v Dundee North End. Others byes . No dates have been arranged for games. resumes training this week after his long absence through injury. Grant Paterson and Sean Christie are free from suspension and are available for this week. Allan Ramsay hopes to be fit enough for selection. OVD 3rd round draw Tayport will entertain Kirkintilloch Rob Roy on December 6. The draw for Round Three is in the Petershill Social Club next Sunday afternoon = 1.30 pm. The gaffer brought in Doug Scott on the subs bench for cover today and Barry McNaughton was at the match. Barry is on his way to recovery but his face is still badly swollen. Participating clubs have been canvassed by the SJFA on their opinions with regard to the Super Cup, it's format, timing etc. It is understood that the colour element in the Port Prog could soon be coming to an end. escalating costs have meant that the programme will return to black and white issue. Port supporter Andy Robertson (of Andy and Sandy fame) had an e-mail from a friend in Detroit, Steve Barnett. the e-mail was brief and to the point. "I'm coming over. Are the Juniors home any of these weekends?" Looks like a trip to Aberdeen could be on the cards. Latest news update on the injury to Barry McNaughton. Barry was taken to hospital during the half time interval and was kept under observation until 10 pm Saturday evening. Nothing is broken but his eye is closed and he required paper stitches to the wound. Here are the odds from William Hill Camelon are still being the subject of many enquirys to win the Scottish Cup, there latest odds are 25/1. Redwood Leisure 1st round results. Grant & Scott on the mend, Allan close to comeback. Latest update on Grant Buist & Scott Peters is they are both making headway towards their recovery. Grant's Scaphoid fracture to his hand has kept him out of the squad for the last few weeks. Scaphoid fractures can sometimes have a lengthy healing process. Scott's recovery is targeted for around the turn of the year. Allan Ramsey's is on his way back and is back in training. Allan could be up for squad selection this weekend. Defender Grant Buist will be out for at least six weeks after breaking his hand against Oakley on Saturday. Grant had fallen awkwardly on Saturday but shrugged it off as a stave. However the pain remained and the extent of the injury was only revealed Tuesday night after physio Norrie Marshall suspected all was not well and suggested Grant visit hospital. A reminder to those traveling to the match at the Canniepairt tomorrow, Leuchars holds its yearly Air Display and traffic in the area could be busy. 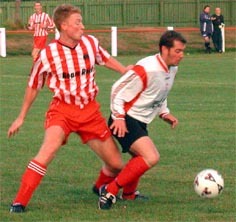 Tayport utility player Dougie Scott (40) has announced his retirement. In making the decision, Dougie recognised that the time resource required to maintain the fitness level necessary to compete at the top level in the junior game, was conflicting with off-the-field commitments. After a lengthy career in the senior game and recovering from the injury which effectively ended his senior career, Dave Baikie persuaded Doug to give it one more season and sign for Tayport. He agreed.......and what a season! Although not a regular starter, the season was a big bonus for Doug and ended with him collecting Scottish Junior Cup and Superleague medals last season. We wish him well in his retirement. Alan Ramsey may return to light training on Wednesday, although his return to action is still some weeks away. The draw for the OVD Scottish Junior Cup will now take place on the 17th September. Ties will be played on 11th of October NOT the 4th as previously advised. Harris Academy has commissioned a photograph of former pupils Gareth Dailly, Roberto Morris, Derek Wemyss And David Evans with the Scottish Junior Cup. The photographs will be added to the Hall Of fame at the school which has a collection of photos of former pupils who have had success in the sporting world. Roberto Morris faces a fitness test for tomorrow's match against Linlithgow Rose after picking an injury last week against Hill Of Beath. Ralph Hunter and Ben Honeyman return to the squad with new signing Sean Christie (from North End) also inline for a possible starting place. Port go into this match looking for their first win in this seasons Championship. Linlithgow Rose are in a similar position on one point after 2 matches making this rematch of last years OVD Cup Final a game to look forward to. Tayport manager Dave Baikie continues to look to adding to his squad. Keep an eye on the news page for further updates. David Evans is set to sign for Raith Rovers tomorrow (Friday). The Tayport No. 11 for the past three seasons played an impressive trial for the Kirkcaldy side in midweek. Ben Honeyman heads for goal. Broughty Ferry 1 Tayport 3 Tayport goalscorers Ben Honeyman, Gareth Dailly and Brian Craik. BF scorer Duell. Good workout for the Port. New signing Kevin Heenan played in the starting line up today. Signed from Arbroath FC. A right sided winger with Arbroath Kevin was reported to have interested Liverpool and Hearts a couple of seasons ago. during these changes. The site will be updated with fixtures/results and any news which becomes available. Forfar Athletic and Dundee United. Membership includes All home matches. fat with the management over a cuppa. all away matches when we travel by coach. Robbie Holden the Goal scoring teenager has signed for Kinnoull. Robbie from Bridge Of earn scored the last minute winner in the North End Challenge Cup Final. for adults and £10 for concessions. the same for one SPL match. enjoy a cuppa and a bit of a cake/biscuit.